Article - when you ask for Rubber Mat what do YOU mean? Commercial – Carpet "Look Alike"
Other – Mats that simply do not fit in either of the categories above. Commercial mats are usually used to minimize the amount of dirt getting into premises, absorb water, muffle the sound of foot traffic and add to the interior/exterior design element. Vinyl or rubber backing may have cleats to minimize mat movement on a carpet (not recommended on hard surface). Edges may be raised to prevent water from flowing off the mat. 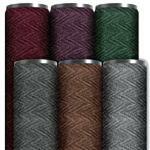 Sometimes the edges are made of the nylon fiber that the mat is made of in a matching color. 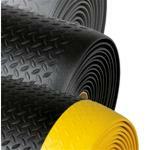 Usually these mats are rectangular shaped but are also available with rounded or half circle ends. Some may be cut in different shapes but that has to be done by you or your maintenance staff since the manufacturer will not do that. Anti-Fatigue wet, Anti-Fatigue dry environment and runners. Mats in this category take into consideration traction, worker comfort, drainage and resistance to chemicals and heat/sparks. Many custom sizes are available as well as full rolls and interlocking tiles. 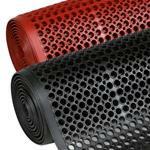 Some of these mats come in an extra Nitrile version (red color) and are grease proof. Each product that has been tested for exposure to common chemicals has a link on the page listing the resistance chart. Mats in this category are of a more specialized nature taking into consideration needs other mats do not meet. 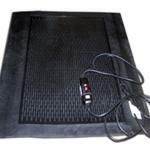 For example the heated mats will actually melt falling snow relieving the need for shoveling on snowy days. Switchboard matting on the other hand addresses the need for flooring that can be used around sensitive electronics while also offering anti-fatigue benefits. Clean mats remove dust and other particulate contaminants from shoes entering facilities such as hospital emergency rooms and clean-rooms used in assembling delicate electronic equipment. Recessed grates address the need for heavy duty custom-made mats that can handle large amounts of debris, moisture and heavy traffic. One type of recessed mats offers the convenience of replacing worn-out strips one at a time as opposed to having to replace the entire mat.